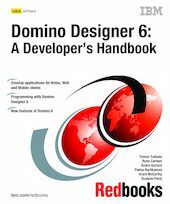 In this IBM Redbooks publication, we describe how to develop applications with IBM Lotus Domino Designer 6. With Domino Designer, you are able to create applications hosted by a Domino server. These applications can be used by different clients, such as Notes clients, Web browsers or mobile devices. We introduce, and show in detail, how you can use all the design elements of Domino Designer, such as forms, pages, views, agents, outlines, resources and framesets. Readers who are familiar with developing applications using Release 5 of Lotus Domino may want to start at Chapter 12, which introduces the new features in Domino 6.0, and continue from there. This book was written for technical specialists, developers and programmers, customers, IBM Business Partners, and the IBM and Lotus community who need technical understanding of how to develop applications using IBM Lotus Domino Designer 6.0.